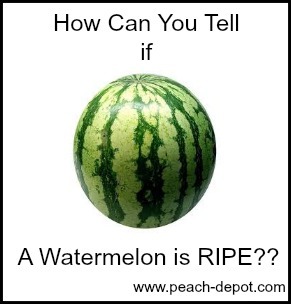 If a Watermelon is RIPE? How can you tell if your watermelon is a ripe watermelon before you buy it, or before you harvest (pick) it? I am not sure about you, but I have always wondered this, but never searched this before going to buy one of these thirst quenching fruits. I have often found myself in a busy grocery store, somewhat awkwardly lifting up a heavy watermelon, and then "knocking on it", in an attempt to see if the melon was ripe. I always felt a bit embarrassed, because I did not even know what I was supposed to hear to assure me that it was, in fact, a ripe watermelon! I had just "heard" that that was the test to determine if a watermelon was ripe or not. Perhaps you grow your own watermelons, and are wondering how you can tell if your watermelon is ready to be picked. After the enjoyment and satisfaction of having observed your watermelon plant producing these succulent fruits, you certainly do not want to harvest it too soon, knowing that (unlike cantaloupe), watermelons do not continue to ripen after they are picked. It is frustrating to cut open a watermelon, and find it to be unripe, light in colour, and not sweet to the taste, or overripe, mushy and tasteless. 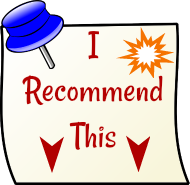 Here is what I have learned about choosing watermelon when purchasing one, and how to know it is ripe, and ready to be picked. 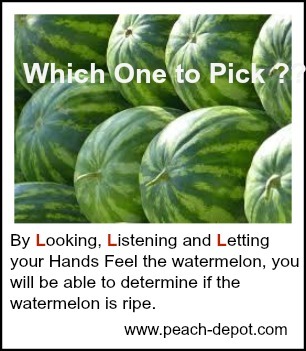 By Looking, Listening and Letting your Hands Feel the watermelon, you will be able to determine if the watermelon is ripe. Watermelons should be firm, generally symmetrical and without bruises, cuts or dents. Scratches are a normal part of the mature watermelon, occurring naturally in the garden. A ripe watermelon will feel heavy. Watermelons are about 92 per cent water, and most of the weight is the water. On one side the watermelon should have a creamy-yellowish coloured spot where it has been laying on the ground during while maturing. If this spot is missing, the melon may have been harvested too early, which will have a definite affect on the taste and juiciness of the fruit. If you are checking watermelons still in the garden, locate the curly tendril attached to the vine that is closest to the fruit. As the watermelon ripens, it will become brittle, as it will begin to dry. One of the most reliable methods of determining whether or not a watermelon is ripe, is by tapping on the watermelons with your fingertips, or rapping against them with your knuckles. When performing this very simple test, a ripe watermelon should give a hollow sound and feeling. By doing this several times, and with different watermelons, you will see the difference between the hollow sound of a ripe watermelon and an unripe fruit. Watermelon should be stored in the fridge, or, if the melon is too large to fit in the fridge, store uncut watermelon in a cold cellar, or on the counter top for several days. 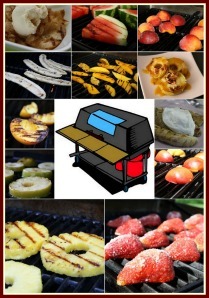 (Once cut, watermelon must be stored, covered, in the refrigerator).